October is always a big month for the top competitors in the digital slot machine space. Everyone is on the lookout for new Halloween themed slots, and the industry’s biggest developers are working hard to deliver them. 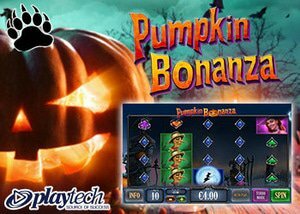 Today, we’ll peek under the lid of Playtech‘s new Pumpkin Bonanza Slot. There aren’t many symbols to speak of, which is a good thing for a 10-line game. Another plus is that the lines pay out both directions; left to right or right to left. Higher paying symbols include the full moon, witch and scarecrow. On the low end are four luminous jewels; purple clubs, green spades, blue diamonds and orange hearts. The only other symbol in the game is the pumpkin. Don’t let his creepy carving scare you though. You’ll want to see a lot of him, because he’s the Wild in Pumpkin Bonanza. He only appears on the third reel, and will only have a chance to appear if there are matching symbols on the left or right side that he could potentially create a winning combination for. When the Pumpkin Wild Feature triggers, you’ll hear a voice say “trick or treat”, followed by the middle reel lighting up orange and spinning a mixture of pumpkins and other symbols. He can appear alone or stacked, or miss the reel completely. Another bonus to look out for is the Bonanza Spin Feature. This one will automatically activate any time a player gets lucky enough to line up a winning combination in both directions, left to right and right to left. The pumpkin fades into view, taking up most of the screen while cackling, “Pumpkin Bonanza!” A free respin is triggered where all of the symbols on reels 2, 3 and 4 light up orange with the potential to land wild pumpkins, stacked or alone. With a lot of luck here, players could unleash the highest possible payout of up to 2000x the total bet. 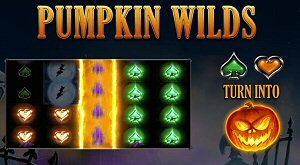 The new Pumpkin Bonanza Slot is a fun choice, but not the most feature-rich game on the holiday market this year. If you’re looking for a bit more, some other frightfully interesting creations have come out of the digital labs of top developers this month. Wicked Tales: Dark Red is a new title by Triple Edge Studios, available at all Microgaming casinos including my personal favorite, Royal Vegas. The clever crew at Yggdrasil brought us Wolf Hunters, which you’ll find at LeoVegas and other mobile casino brands. If it’s not freshness you seek but rather ultimate entertainment, there’s one game that out-scares them all. It’s not exactly a new Halloween slot machine, having been released in 2017, but there’s nothing more spine-tingling than Michael Meyers and his hollow piano soundtrack. You’ll find the Halloween Online Slot, mimicking the original 1978 John Carpenter film, at all Microgaming casinos.